Kirklees Council is to pump almost half a million pounds into salaries for a quartet of new senior executives – including a fresh leader for its Children’s Services department. Recruitment of the new role will see basic salaries for the authority’s 16 most senior and high-paid staff top £1.5m. And it appears to contradict the council’s decision, made last year, to trim back the number of senior staff as part of austerity cuts. In 2017 Kirklees “reshaped” its senior management structure, reducing its strategic managers from five to three as part of a four-year drive to make savings of £104m. The authority was sharply criticised in 2016 when watchdog Ofsted deemed its services for vulnerable youngsters to be unsafe. Children’s Services are currently being run by Steve Walker, who was seconded from Leeds City Council in 2017 following the sudden resignation of previous director Sarah Callaghan. Kirklees is also seeking a finance director following the departure of Debbie Hogg, who has joined Doncaster Council as director of corporate resources on a salary of £121,000. That position and another for economy and regeneration – both on the level beneath strategic directors – will each pay between £85,000 and £98,615. One role is currently vacant. The other is a temporary role that will be made permanent. Chief executive Jacqui Gedman is the highest paid council employee in Kirklees. She earns between £150,000 and £155,000 a year – around the same level as Prime Minister Theresa May. Richard Parry, strategic director of adults and health, earns between £125,000 and £126,812. He’s responsible for adult social care and community services. In 2016 on top of his council duties he also became the chief executive of North Kirklees Clinical Commissioning Group (NKCCG). His appointment was to cover the retirement of Chris Dowse. Even though he took on greater responsibilities and was doing Ms Dowse’s £115,000-a-year job, Mr Parry received no extra pay for the combined role. Strategic director for economy and infrastructure Karl Battersby, whose role includes managing refuse collections in the borough, collects £120,000 to £125,000 per annum. 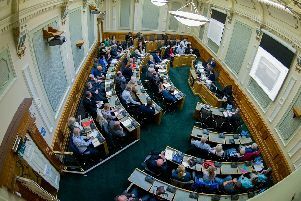 He joined Kirklees in February after a two-year stint at Wigan Council, where he oversaw changes to a three-week black bin rota. The move was deeply unpopular with residents. Rachel Spencer-Henshall is acting strategic director for corporate strategy and public health. The salary for that role is understood to be in the region of £100,000. Kirklees Council Leader Shabir Pandor said the authority was looking to fill a number of roles within its existing leadership structure. He said that the move to recruit a permanent director of Children’s Services was reflective of its successful improvement journey this far “and will prepare us for the next stage when statutory responsibility transfers back to us”. The council is also intending to make the temporary role of service director for growth and housing a permanent one.